Securing buildings makes communities safer for everyone. Protecting your properties with our window and door guards prevents them from becoming hotspots for crime and vandalism. When vacant properties aren’t cared for, they can blight a neighborhood. DAWGS create an impenetrable seal that keeps buildings empty and safe, preventing crime from moving in. Whatever your plans for the neighborhood may be, DAWGS keep them safe and give you unparalleled peace of mind. With DAWGS on your side, your agency’s properties are always protected. At DAWGS, we work with different government agencies and public housing authorities to provide steel-secured solutions for virtually any project. 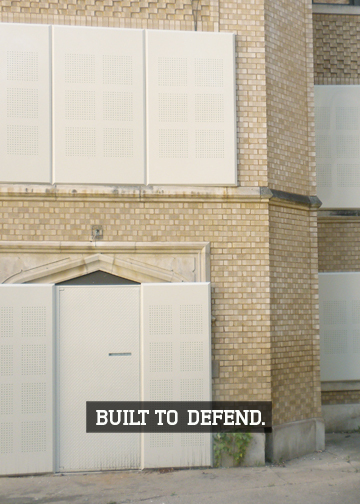 Whether working on a public housing property, hospital, school, university, library or any other government-owned property, DAWGS give you the utmost in durability and strength for unsurpassed vacant property security. Our door and window guards come in neutral colors, and their unique powder coating makes graffiti removal easy. With DAWGS window and door guards, you can protect your neighborhood and keep it beautiful all at once. DAWGS sports a unique modular design that makes them perfect for doors and windows of all shapes and sizes. Click here to contact our rental services department and learn more about your vacant property security options, or call us at 1-877-88-DAWGS (32947).